I struggle big time with being anxious due to fear of the unknown. We are constantly seeing tragic stories in the news and on Facebook that remind us how fragile our life on earth is – Parents losing children to freak accidents or illnesses; Spouses losing the person they thought they’d spend the rest of their lives with; Excited parents losing their babies before they had a chance to know them; Former classmates taking their own lives; Families losing their primary source of income due to lay-offs; Brothers and sisters in Christ being diagnosed with terrible diseases such as cancer and ALS. When I hear about these things, my heart hurts so bad for them because I can’t imagine (and I never want to imagine) what it feels like to experience that. I almost immediately turn to God in prayer for them, asking Him to be with them and to comfort them in ways that only He can, but then I selfishly ask God to never let the same happen to me. I also worry about our finances. Since making the decision to stay home with the kids, we have not been able to save money at nearly the rate that we were before. Our goal was to save up to be able to make a down payment on a house in the next few years and move into Madison (our house is kind of far out here, although we are zoned for Madison City Schools). Instead of growing our savings account, it has actually shrunk due to large unexpected expenses over the last year, which makes us worry what appliance or car is going to break next? How are we going to save for retirement or the girls college tuition or weddings? In the past I have even found myself wondering why we have it so good. I could not be happier with this life that God has handed me with David and my two girls, but when I hear of things happening to other people, I wonder why does that happen to them? Why do I get to have a loving husband (who does dishes and helps with laundry), and two healthy children? Could it be too good? When is the other shoe going to drop? If we’ve got it this good, then eventually will something just as bad happen to us? One of my goals for 2018 was to be more diligent about studying the Bible. I have studied a few New Testament books closely and have had the opportunity to read some study books/devotional books as well. Through all of this, I have found myself growing closer to God and better able to cast my fears and worries onto Him. This is what he wants us to do! Through study I have found a peace that I did not have before and it is the realization that God will always provide. I want to share a few thoughts, and a few verses, that help me feel more at peace when I start to feel my mind wander with worry. God promises us that He will never leave us. He is always here for us. Why then do we often turn to other outlets for comfort in rough times, when the One being who has complete control in our lives is always present? I also like to turn to Hebrews 13:5 when I begin to worry about finances. It reminds me to be content and that God will provide. I like this passage because Jesus is telling his disciples not to worry about food or clothing or anything else. He basically says if God provides for the birds and the flowers and the grass, don’t you think that He will provide for us, who are of much more value to him than the birds and the flowers? 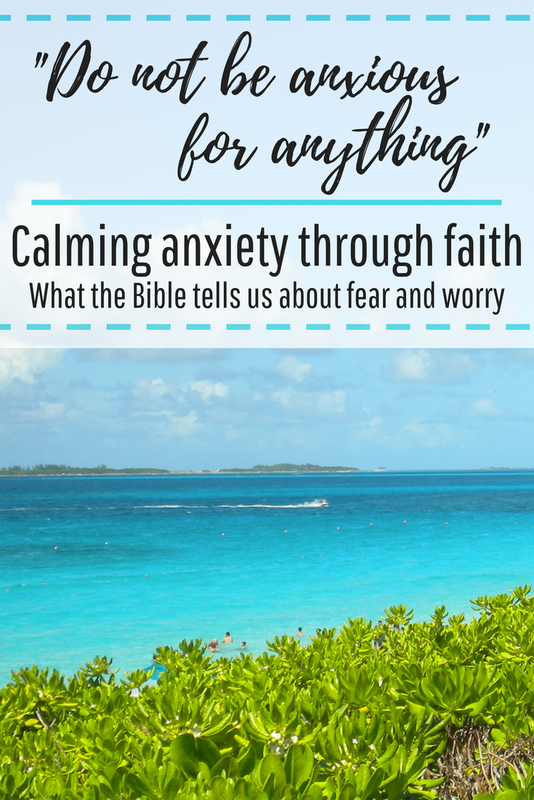 He says “Which of you by being anxious can add a single hour to his life span?” If God provides for nature, he will provide for us, and there’s no reason to worry. “Do not seek what you are to eat and what you are to drink, nor be worried. He wants us to cast all of our anxiety on Him because He cares for us and is able to comfort us in ways that we can’t comprehend. We are told numerous times throughout the Bible that we are going to face trials, but we are promised that if we lean on God for our strength, then we will gain the strength that we need to persevere, plus some. This chapter in her book was a gut-check for me. It was then that I realized that I should not be worried about the unknown or what trials/pain I may have to suffer down the road. This is a hard one to accept, and I pray about it often (because I still have a tough time fully turning our lives over to Him and saying “your will be done, no matter what that involves”), but I know deep down that God has the big picture in mind, and even if the unthinkable were to happen to my family, I know that we will make it through and we will be ok. This does not mean that every thing that happens in our lives will be good, but it will all work together for good in the end. This is one of my favorite verses and I find myself repeating it in my head when I feel myself becoming anxious. When my mind is spinning out of control with “what if’s,” I’ll meditate on the words “the peace of God that surpasses all understanding will guard your hearts and your minds.” (When I say I “meditate,” I’m not sitting with my legs crossed going “ommm.” What I mean is that I repeat the words over and over and try to really think about what they mean.) What I’m trying to remind myself as I do this is that I do not understand it. It is far beyond the comprehension that my tiny human brain is capable of. God is the only one that knows the plan. He sees the big, eternal picture and He has my best interest in mind. I may not understand why something I see as tragic is happening, but HE does. This peace that we find by casting our anxieties on Him through prayer will guard our hearts and minds, and we will find a comfort that we cannot find anywhere else. 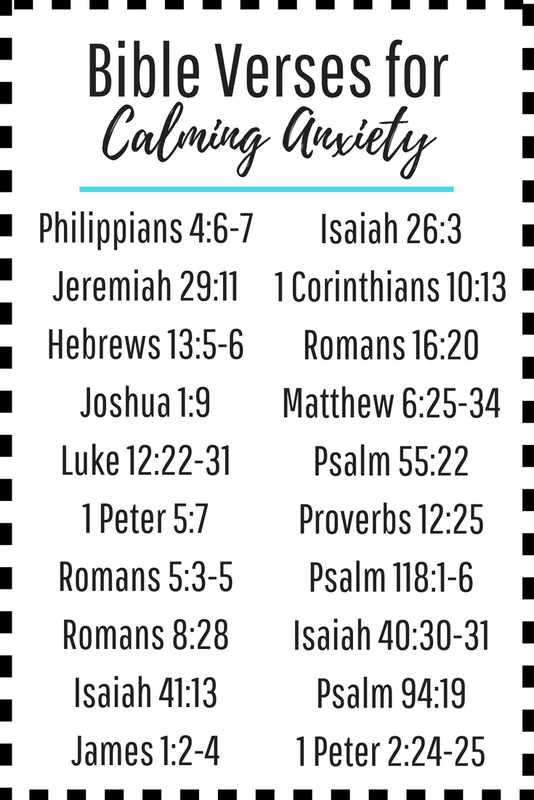 My hope and prayer is that these verses will reach someone out there, and will help ease some anxiety, as they have helped me. I have found that consistent bible study has helped me to draw closer to God, and gain a better understanding of His character, what He expects from me, and ways that I can live my life in the image of Christ. Through this, I have been able to develop a peace with our current situation and ease the fear of the unknown that seems to frequently creep up. I will link to the study/devotional books that I have read lately. If you choose just one out of these, I would recommend “By His Wounds You Are Healed” by Wendy H. Alsup. The others are great, but this study of Ephesians dove straight into scripture and has set a foundation for studying other books of the Bible. Can you relate? What things worry you? What do you do to ease your worry? Do you have any verses you would add? Please contact me if you have any questions or comments about anything!